In 1989, mysterious stickers featuring an image of André the Giant with the slogan “Andre the Giant Has a Posse” began appearing in Providence, Rhode Island. Designed by a then-anonymous Rhode Island School of Design student, this campaign quickly took on a life of its own as the image appeared in cities across the United States. The brainchild of Frank Shepard Fairey, known professionally as Shepard Fairey, his name would become synonymous with the OBEY Giant works this early design would stylistically and semantically evolve into. While primarily associated with street art, screen prints, and stickers, Fairey has delved into the designer toy movement during the course of his nearly thirty-year-long career, including hand-modified one-of-a-kind works and factory-produced pieces, including a sculptural interpretation of his original character creation Mr. Spray. Released in 2004 as a limited edition, signed and numbered screen print, Mr. Spray appears as a parody of ’50s advertising mascot Otto the Orkin Man, the anthropomorphic pesticide spray can having been altered by Fairey into spray paint can. With Fairey’s rendition grasping its creator’s ubiquitous tool of choice, an OBEY stencil, and being associated with the slogan “make art, not war”, this piece is easily interpreted as a pro-graffiti statement, a cartoonish mascot with a countercultural message. And while this design did not become one of Fairey’s more prolifically used or iconic concepts, it was evolved into a vinyl figure edition by the artist in partnership with STRANGEco, the facial sculpt and paint master for this interpretation executed by Adrianna Bamber. Initially seen in prototype form during a visit to Fairey’s Los Angeles studio by Arrested Motion in November of 2008, it would be more than a year-and-a-half later before factory-produced editions were finally issued. Grasping a mini OBEY stencil in honor of its creator, the roughly 11-inch tall Mr. Spray form beautifully maintained the classic, cartoonish aesthetic of its two-dimensional counterpart without making the sculptural transition seem unnecessary. Granted the illusion of functionality through this shapely rendition, the mascot character debuted through a preorder directly from STRANGEco on Tuesday, July 6th, 2010 in two distinct colorations, highlighted accents on Mr. Spray being emblazoned with either black or red decoration. Limited to editions of 350 vinyl cast pieces each, these made their publicly displayed debut alongside a 100 piece silver colored edition at that year’s San Diego Comic-Con on Wednesday, July 21st. 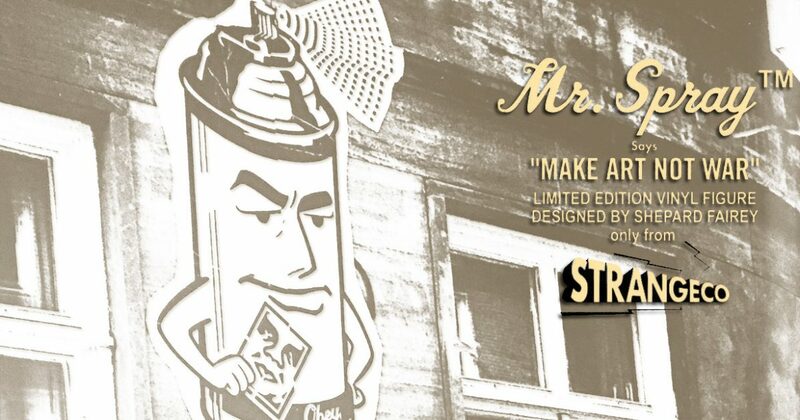 A fourth and final Mr. Spray color variation was issued exclusively through Fairey’s OBEY Giant website on September 2nd, 2010, the printed card box packaging of the form coming signed by the artist for the entire 200 piece edition of this gold version. And though Fairey’s name has been attached to several sculptural works, this one felt especially poignant; a transformation of the corporate mascot form into an artistic call to arms.